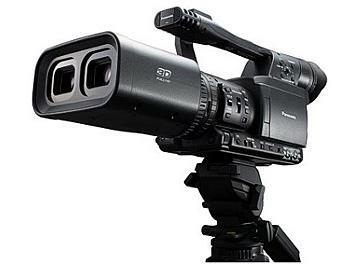 The Panasonic AG-3DA1 is an integrated twin-lens Full HD 3D camcorder with file based recording. * The two independent optical systems add flexibility to expressive 3D image recording. * Automatic correction of left-eye/right-eye image deviation within the camera. * Equipped with two 1/4.1-inch Approx. 2.07 megapixels MOS units for left-eye and right-eye images. * The recording system uses AVCHD Pro high-image-quality PH mode. Full-HD left-eye and right-eye images are recorded in sync onto two SDHC Memory Cards. * Switchable 60Hz/50Hz for worldwide recording capability. * The lenses, camera head and recorder section are integrated into a compact body. Unlike a conventional rig-type 3D camera system, this model brings excellent flexibility and mobility to FULL HD 3D recording. * Lightweight camera body weighs less than 2.8 kg (Approx. 6.17 lb.) for excellent mobility. * Equipped with a 3.2-inch (16:9) side-mounted LCD monitor with approx. 921,000 dots. Lch/Rch/overlay switchable display. * Equipped with HDMI 1.4 (frame and field sequential output) in addition to HD-SDI (x2, simultaneous). * Provided with an XLR Audio input terminal for line recording in halls, studios, etc. * Equipped with remote terminal for focus iris, zoom, REC start/stop, and convergence point. * Auto REC function for control of REC start/stop of an external recorder connected by SDI.